A number of schools have signed up for the Forest Watch Student Convention, Friday, May 27, at UNH. We still have room for a few more! Middle and high school students who participate in Forest Watch are invited to present posters or demonstrations of Forest Watch activities, field methodologies, laboratory measurements, data analyses and any other aspect of the program. We also have invited our four Maple Watch pilot schools and home school family to bring posters. 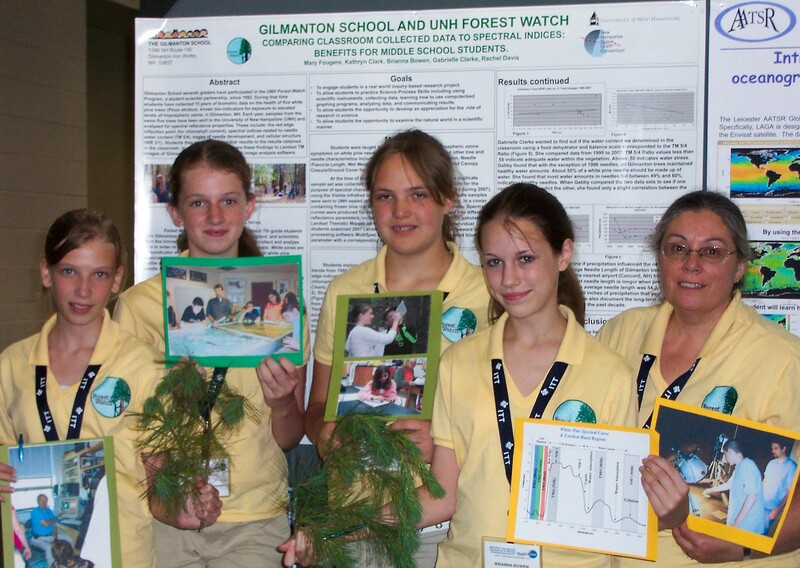 Mary Fougere and her Gilmanton School students, pictured here, will display their 2011 research in two posters. Forest Watch veterans will give talks on how Forest Watch began, new web-based tools for studying forest health and how Forest Watch works in the classroom. Karoline Goulart from the Admissions Office will also be on hand to talk with students and chaperones. Lunch will be student choice at the Hallowell Center’s fabulous dining hall. After lunch, participants will have a chance to meet UNH researchers and to learn about current research in Durham. Groups of 10-12 students and teachers will have time to visit two labs including the Forest Watch lab. The Convention will run from 10 a.m. to 2 p.m.
Email for more on this if you think you can come. forestwatch@unh.edu. Teachers who are new to Forest Watch are invited to attend the Convention to meet teachers and see students in action. Forest Watch Training for New Teachers, July 25-27. A training workshop for new Forest Watch teachers will be held on July 25-27. The workshop will introduce teachers of K-12 students to Forest Watch research in ground level ozone and its impact on white pines. Teachers will learn how to establish a study site near their schools and how to collect samples and biometric measures of trees and site conditions. Teachers will learn about Forest Watch classroom/laboratory protocols for measuring and analyzing samples. They will use the UNH visual infrared intelligent spectrometer (VIRIS) and the scanning electron microscope (SEM) to see how our staff tests school samples in our UNH labs. Teachers will also have time to develop and present classroom lessons for their own students. And we will squeeze in preliminary ideas about our new branch, Maple Watch. The workshop will cost $600, including two nights stay at the university and meals. Commuters may arrange deductions on this price. Attendees may obtain continuing education credits for the workshop. Email forestwatch@unh.edu if you are interested. Mary Fougere and her Gilmanton School students will be out on April 18 to collect white pine samples. Martha Carlson, Forest Watch coordinator, will bring the longest pole pruners we have to reach the needles on Gilmanton’s tall pines. Please email Martha, forestwatch@unh.edu or Martha.carlson@unh.edu for a cooler and refresher info sheets on collection protocols. She will send you the cooler with a return mailer. If you need some help collecting, Martha will visit, help out in the field and chat with you and your students. Phil Browne near Concord, Louise James on the North Shore in Massachusetts, and Bob Dyer in southern Maine are also on call to help nearby Forest Watch schools. These Forest Watch veteran teachers would love to help. And they may have lots of tips on how you can integrate Forest Watch more fully into your present curriculum. We’re in cyberspace! The new Forest Watch website is up and running. Thank you. Forest Watch teachers suggested many ideas for improving our program. A new web page topped your list. David Bartlett, Director of the New Hampshire Space Grant Consortium, heard your enthusiasm and your good ideas. Thanks, David. 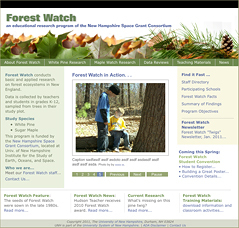 Please send us an email forestwatch@unh.edu with any comments or suggestions for making the web site better. In the future, we hope to add a few more goodies: A Query tool; Direct Input of your Biometric data; Direct access to Landsat images; A Gallery of your school’s photos. Forest Watch student research may be more important than ever this year and in the future. As climate change heats up the atmosphere and as auto emissions increase with world population growth, more ground level ozone is expected. Other air pollutants may also appear in New England. Was air pollution a factor, for example, in the very strange needle drop many students, teachers and other citizens noticed last spring? 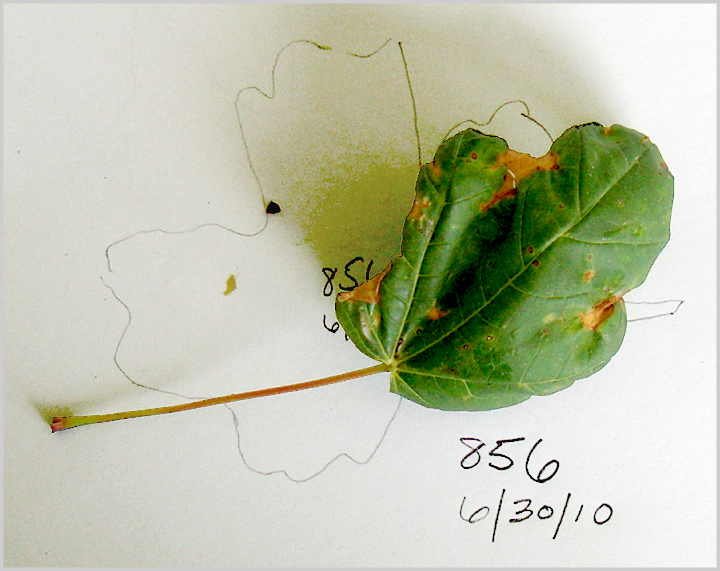 Many of our fall samples in 2010 had no two-year-old needles! White pines should retain needles for three years. Was the needle loss caused by a fungus, as UNH Extension scientists think? Or was it a combination of air pollutants and unusually hot spring weather as Dr. Rock suspects? Extension botanists believe the needles were infested with Brown Spot Needle Blight caused by Scirrhia acicola or Canavirgella banfieldii. The spring collections of needles which Forest Watch schools make may tell. Students will be able to see signs of fungal hyphae or leaky cells damaged by ozone on fresh sections they make and examine in the microscope. When you slice those needles, don’t forget Dr. Rock’s carrot microtome!